Europeans, from at least the Middle Ages until modern times, have used vinegar. For example, it is possible to find recipes that call for mixing ginger, cloves, cinnamon, cardamom, mace and long pepper, then squeezing out bread soaked in vinegar, straining out all of this together and salting to taste. Vinegar helped solve the problem of the lack of food during the long sailing voyages as Europeans exploited other cultures. One of the common foods was a kind of biscuit. This was a simple mixture of flour and water that was baked and dried until it was so hard that it was nearly impossible to break, even by hand. In order to eat the biscuits, the sailors soaked them in their water rations until they became porridge-like. They then improved the taste of this porridge by adding vinegar and a bit of salt pork. This combination of vinegar and salt pork gave a kind of dignity to dishes like Lobscouse, Scotch coffee and Skillygolee. During the 17th century in Britain, when the cities smelled offensive, people would use sponges soaked in vinegar to deodorize their immediate surroundings. They often carried these sponges in small silver boxes. The Victorian ladies, who were known for their "vapors," restored themselves with vinegar soaked-cloths, which they placed across their foreheads. The inclusion of vinegar into British food preparation techniques made it possible to transport food over longer distances without it spoiling. This meant that people in the inland area could enjoy seafood on a more regular basis. The great sea power for which the British were famous was made possible in part by vinegar. Mark Beaufoy built a healthy business with contracts to supply vinegar to the British navy. The vinegar was not only used to preserve food for the long sea journeys, it was also used as a detergent to clean the decks of the ships. During the reign of Louis xiii, the Duc de la Meilleraye, the grand master of the artillery of France, presented the French government with a bill of 1,300,000 francs for vinegar that was used to cool the cannons. The bill was paid without protest. The great wines of France have produced some of the finest vinegars ever made. The process of making some of the finest vinegars possible is named after the French town of Orleans, which is legendary for its fine vinegars. Though it is quite probable that the Japanese knew how to make and use vinegar much earlier, the first time we find documentation of vinegar was during the reign of Emperor Ojin, about 399-404 A.D.. That’s when vinegar-making techniques crossed the Japan Sea along with sake making from China. During this period, Osaka was the cultural in Japan. This is also when vinegar making was refined in Japan. In the Heian (794-1192) period Vinegar developed into an art form in Japan. By this time, the Japanese were using plum vinegar, iris vinegar and miscellaneous fruit vinegars, as well as sake vinegars. During the Muromachi period, (1400-1603) vinegar gained wide acceptance as a flavoring for cooking in Japan. Condiments such as vinegar-miso, ginger vinegar-miso, sansho vinegar-miso, wasabi (a kind of horse radish) vinegar and walnut vinegar became popular. 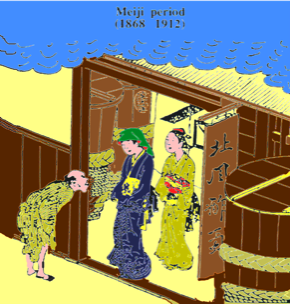 During the Edo period (1603-1868), mass production of vinegar was established. During the Meiji (1868 1912) period, the Japanese began to create new products, using foreign food-processing techniques. Today Japan is among the world leaders in research and development as well as production of vinegar. And some of the finest vinegars in the world are made there. Probably the most familiar account of vinegar in the Bible comes from , Mathew, Mark, Luke and John. They reveal that when Jesus was crucified, vinegar was the last thing he consumed as a man on earth. St. John 20, verse 30; "When Jesus therefore had received the vinegar, he said, "it is finished" bowed his head, and gave up the ghost." Notice that each of the four writers give a slightly different account of the events, though they are substantially the same. The drink referred to in St. Mathew 27, verse. 37 was probably intended as a narcotic. We draw this conclusion from the fact that the word gall in Hebrew translates through the Greek to opium. It appears that this concoction was commonly given to people about to be executed. It is important to realize that the drink that Jesus was given was most probably posca, a diluted vinegar that was the common and popular drink of the poorer classes and the Roman soldiers. It was very common for the soldiers to keep this drink with them at all times. (See Roman use of vinegar.) The final offering of vinegar to Jesus was in his response to his declaration that he was thirsty. So it appears that the offering of vinegar was quite likely a benevolent act by Roman soldiers whose government had agreed to crucify Jesus as a political concession to the Jewish leaders. One writer, Rosenmuller, conjectures that it may have been given as a stimulant to keep the victim alive during the torture, but this seems to be a minority opinion. What we can see without conjecture is that the last request Jesus made was filled with vinegar. And the last thing Jesus had to drink before leaving the world as a man was vinegar! Since early Jewish literature makes a distinction between "vinegar of wine," homez yayin and "vinegar of strong drink," homez shekar, , it is certain that vinegar was a very familiar item. It was used to wet the flat loaves of bread that were commonly eaten at that time. It was mixed with water and used as a drink, though it couldn't cure thirst by itself. Pickles and meat were preserved in vinegar. Lettuce and endives were dipped into it. It was used as a condiment. Vinegar was also useful in freeing olives from their pits. Aside from culinary uses, vinegar served as an astringent as well as an agent for soothing and cooling the body. In fact, because of this calming effect, vinegar is forbidden on the day of atonement. It was employed for combating dandruff, used as a gargle for toothache and even as a dressing for wounds. It was also used as a mordant for dying. In the Bible in the Book of Ruth, Boaz invites a guest to “eat of the bread, and dip thy morsel in the vinegar". This suggests that it was a common practice to dip morsels of bread into vinegar as a kind of sauce. This was a practice that the Jews apparently shared with other people of that time and region. Vinegar is mentioned numerous other times in the Bible indicating that the Jew were very familiar with vinegar. Thought the Egyptian probably used vinegar long before then, the first documentation I could find word vinegar in Egypt were words written by foreigners. It is mentioned by Pliny, the well-known Roman naturalist and historian. He wrote about whole volumes that had been written on how to keep wine from turning sour. He mentioned also that an excellent quality of vinegar was made from the Cyprus fig and that an even better quality came from Alexandria. . There is also a rather well-known and colorful story of the famous Egyptian queen, Cleopatra, and Mark Antony. Cleopatra won a large wager with Mark Antony by dissolving a large pearl in vinegar to make probably the most expensive after dinner drink in history. This episode also points out that the Egyptians had a rather thorough knowledge of vinegar. Dioscorides traveled through Egypt with Nero's army. His writings documented many Egyptian medicines in which vinegar or vinegar combined with honey, brine, thyme or squill was used for many different illnesses. The Egyptians also used vinegar for mushroom poisoning, worms in the ears, bleeding wounds, severe loss of appetitite and gangrene, among other things. One of the earliest recordings of vinegar was made by the Babylonians in about 5000 BC. The Babylonians were noted at that time for the cultivation of date trees. And it was from these fine dates that they first made their prized vinegar. Each tree produced about 360 liters of dates. These were used primarily for making date wine and date vinegar. Vinegar was also be made from beer. The residuals from beer making were mixed with water to make a "thin" beer, which was then allowed to turn into vinegar. By 3000 BC, the making of homemade vinegar seems to have been phased out. The homemade variety had given way to a commercial industry that seems to have reached a rather large size by the year 2000 BC. This industry was apparently part of a very large brewing industry, which was keenly aware of the relationship between alcohol and vinegar. It even assigned special people to watch the beer and wine to avoid the conditions that turned these drinks into vinegar. The residuals from the making of alcoholic beverages were used for soft drinks as well as vinegar. The dates and grains were soaked with water and pressed again to make these other products. These new products resulted in the creation of whole new businesses. The Babylonians must also be given the credit for discovering many of the uses for vinegar. One of their most interesting inovations was the addition of herbs and spices to alter the taste and aroma of vinegar and anything to which the vinegar was added. They used tarragon, ruda, lavender, celery, mint, abysenth, portulaca and saffron. In addition to improving the taste and aroma, these herbs and spices also increased the preservative effect of the vinegar when it was used for pickling. Like most other important discoveries, it was probably the result of an accident. "Someone left the wine out in the air.' But the earliest known recordings of vinegar find it already in common and varied use, so we have no idea how it was discovered. It was also discovered by many different cultures independently, so we have no real proof of where it was first discovered or how it spread to every corner of the globe. Like beer, wine and other fermented foods, the ancients explained vinegar production differently than we do today. Like most other things, they believed, or said they believed, it was the result of some actions by the gods. And who can say that they were altogether wrong or that current theories are entirely correct. All we can know is that people have made and used beer and wine roughly 10,000 years so, it is assumed that vinegar has also been around for about that long. These are just a few of the historical references for Vinegar.